The cup is a really nice eye-catching. Great image, the cup is small, but very important in the composition, and that cloud is impressive! very cool composition with the cup. Brilliant, and yes the cup makes the shot! Love the silhouette! The only thing that would have made this any better is if the clouds appeared to be rising from the hot mug. Well done! Wonderfully composed with the cup and saucer on the ledge. One of the best works I've seen this week. Wonderful, minmal, great. 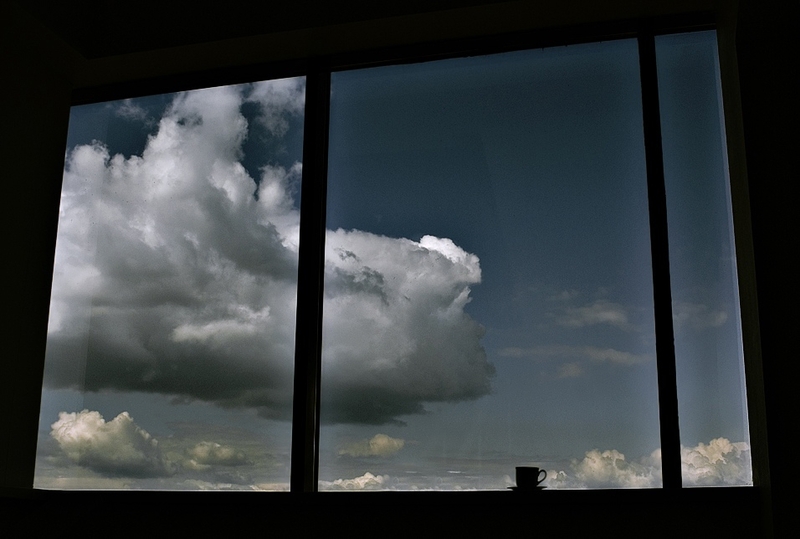 I really like this photo, the combination of the cup, the window and the clouds is really nice. A very powerful image with huge impact. Brilliant. Really a Wow image - excellent - a beautiful image ! An amazing shot, the contrast between the dark window and the clouds are perfect. Great work. I like how the window distorts the frame. And that cup : it tells a story on its own. Inspiring. Impressive idea. Simple but great composition. Got my voting at photoblog awards also for really nice winter scenery shots. Absolutely creative!!! Like it very much, congrats!